RHYTHM OF THE NEEDLES: Eureka, I've Found It! My favorite sock heel is the short row heel. I like the look of it and it fits me best. I've tried many versions over the years, including one that I worked out myself, but I was never totally happy with the results. I've been searching for a long time, looking for a better short row heel and good, clear instructions. Finally, I found exactly what I was looking for from KnitPurlHunter on YouTube. In Part 1 she guides you through the Wrap and Turn rows. I'd done a lot of short rows when I made the Lizard Ridge afghan but it was still good, and reassuring, to knit along with the video. In the picture, below, you can see what the heel looks like by the end of the first video. 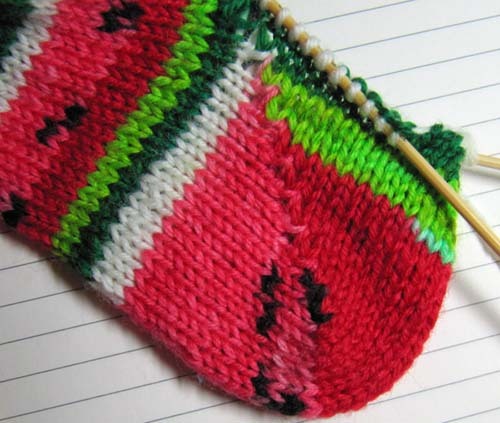 The center part of the heel is built up with more rows in the middle than there are at the ends. ﻿In Part 2 you are guided through the steps to eliminate the wraps around the base of the stitches, continuing to the point where you are knitting circularly again, the beginning of the foot. The result is a nice even row of stitches with no hole. As a bonus, this is the easiest short row heel I've worked yet. Perfect - just what I was looking for. I haven't checked out the other videos offered by KnitPurlHunter, but there are several covering a number of techniques. Checking out her (sorry, I don't know her name) website and blog are high on my to-do list. That is one gorgeous short row heel! Thanks for posting the youtube link. Going to bookmark that one NOW! 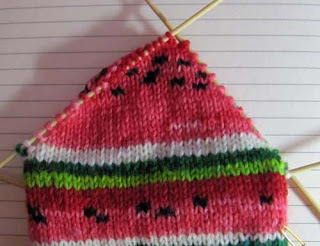 ...and it looks as if the striping of the colors works out nicely. Good technique to know, don't know if I will use it, but good to know. Thanks for replying RE:info on yarn. I forgot to say I enjoyed reading your blog and I'm really eager to get back to blogging regularly again.